For travelers, foodies, and philanthropists who have an eye for local connection everywhere they go. 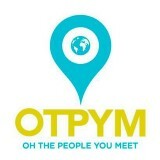 OhThePeopleYouMeet hasn’t been active on Medium yet. Check back later to see their stories, claps, and highlights.